From Abi, Kieran Healy, and the Survey of Earned Doctorates: 2009 data on the gender divide among doctorate-level graduates in academic disciplines (from most to least female by percentage). View the full pdf for even more detail. Wow, talk about confirming stereotypes :( MIT needs women, and sociology needs men. At first I was surprised there were so few women in religious studies... but then I think about how few religions welcome women priests/pastors. If I assume most people get a PHD in religion are doing as part of that sort of study and not in the same way one gets an English degree it makes more sense, I guess. And I'm still wondering (I did while I was in college as well) why Chemistry is so much closer to gender equitable than other hard sciences. Obviously it's still sort of perfection at a little below 40% women, but that's still double what you see in Physics. The chart doesn't go all the way to 100%--that's deceptive. It gives the impression that the percentage of women in psych, lit, etc. is higher than it actually it. I'd be interested to see this compared to data on people entering phd programs (ie. 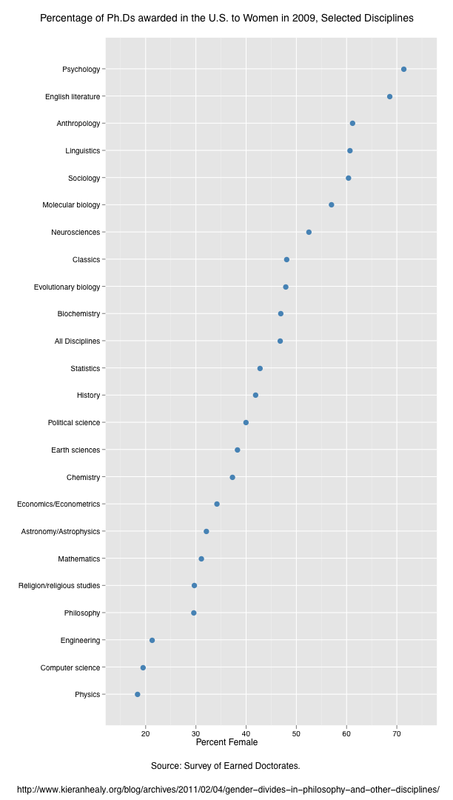 in which disciplines are women admitted but don't finish) as well as data on gender and tenure track jobs. From my own anecdotal experience, I suspect that even in the women-dominated fields (soc, anthro, psych) the majority of even assistant professors would still be men. And yet another point: (almost) all the fields of PhD where women dominate are ones with very little prospects in industry/so-called-"real-world outside the ivory tower". The market is over-swamped nowadays with great young PhDs who have no chance whatsoever to find a gainful, tenure track position in academe. Only very few make it and in many cases, these are people who are willing to make huge sacrifices in the personal sphere (e.g., no family life, postponing having children or not really participating in their upbringing, long-distance relations, no job security, juggling between several positions, moving away from "home", etc.). These might also require some sacrifices on behalf of a partner (same ones + if one follows the recent-PhD-partner in their quest for tenure around the world, a price to one's own career ambitions). All of this doesn't imply of of course that there is a gender bias in those who choose to continue in this race to tenure, but I have a gut feeling that there is one and more men than women would choose to either leave "home" for long-distance relationships, to leave the family-rearing responsibilities with the wife, etc. If we add the fact that more "practical" fields that could also bring lots of industry jobs are not the ones where you have many women PhDs, it means that among those hoards of overqualified burger-flippers (as a figure of speech, in the sense of "not doing a PhD job and lucky to find any at all"), there are plenty of such recent women with PhD in Sociology or English. An analysis of the field with probably the most PhDs: MD-PhDs. Worth noting that anthropology includes archaeology, a field where the gender balance is damn near even. These days archaeology uses as much hard science as anything. Perhaps women prefer that their science tell them something about humans? I have also always found it interesting that the biological sciences tend to have the highest representation of women. I wonder where PhD nurses would fall on that chart. Creepy, considering how far we consider ourselves to have come in the past decades. On a side note, stydying both sociology and political science, the gap between them pretty much confirms what I already suspeced. Which is weird, considering that there's not much difference beween them. Interesting graph! From what I've discussed with friends in the disciplines (in various CA UCs) I would have weighted physics, math and computer sciences as far more male-dominated in the undergrad years, and biochemistry (close to my major, genetics) and related fields as far more female-dominated. I wonder how the gender splits compares in undergrad versus PhDs. My uni is a science and engineering school and has the associated gender imbalance (though this took me a while to notice as I am in a department with "bio" in the name). There's a definite poetry to what the women at uni say of the men: "The odds are good, but the goods are odd". I suspect that by including only PhD, those women in medicine (with MDs) are overlooked. If African-American women were included in this survey, the results would be much worse. I guarantee that this chart is based primarily on White women Ph.D's. I'm also willing to bet that the chart was developed by the dominate group as well.